Walter Alexander planned big things for the village of Blowing Rock, where he summered in the early 1900s to escape the heat of his native Charlotte. He believed the mountain haven was primed to become “America’s Switzerland” (not to be confused with Little Switzerland, the community 40 miles southeast); but first, the town needed a grand inn. If the hotel didn’t quite have it all, its unique setting offered more than most rivals could. The views over the gorge to Grandfather Mountain in the distance were spectacular. The temperature averaged 67 degrees during the summer. And there was no shortage of amusements, from golf, tennis, and swimming to trail riding, hiking, and dancing. The inn was something of a mountain marvel. Clad in chestnut bark shingles, much of its interior was built of chestnut hardwood, and local stones were used to construct the 16 chimneys. Each of the 138 guest rooms had windows to welcome the lauded zephyrs, and huge balconies made sunset-watching a social affair. The grounds were resplendent with azaleas, laurel, and rhododendron. Rustic charm was complemented by touches of elegance, with simple porch rocking chairs just steps away from a gleaming ballroom. Touted by locals as the “Queen of Blowing Rock Hotels,” Mayview drew some notable names, including former First Lady Eleanor Roosevelt and then-Vice President Richard Nixon in the 1950s. But its real claim to fame came earlier: In 1924, Mayview started a gun club directed by sharp-shooting legend Annie Oakley, who came out of retirement for a last hurrah. One account tells of a 63-year-old Oakley in fine form as she blew away 98 of 100 clay pigeons. Mayview Manor closed in 1966, and was demolished in 1978 to make way for a housing development. 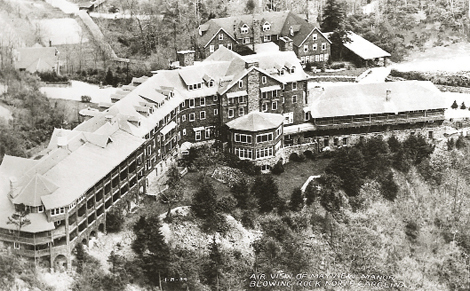 “The loss of this grand hotel,” the Blowing Rock Historical Society later opined, “may have been one of the most devastating moments in the village’s history.” Still, the inn had fulfilled Alexander’s vision, setting a lasting standard for the area’s mountain resorts.